There are some truths we consider to be universal. We're talking about facts of life like how the sun rises in the east and sets in the west or how the food that you order in almost always tastes better than the same food that you cook yourself. Up until today, we thought the phrase "Kiernan Shipka is blonde" belonged in this category. (Here is a picture of Shipka from her exclusive Byrdie interview for reference.) Ever since she starred as Don and Betty Draper's daughter, Sally, in Mad Men, she's been seen sporting similar shades of golden blonde hair. 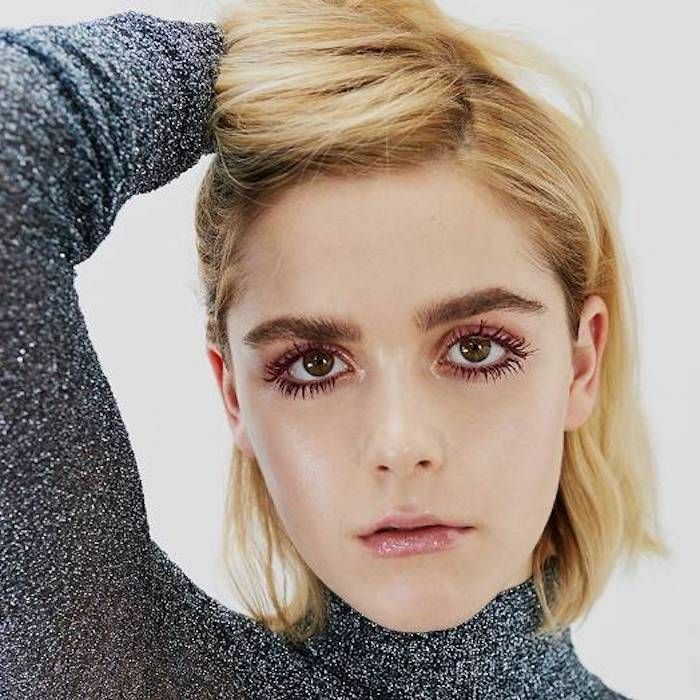 According to Glamour, between her role in Mad Men and her role as Sabrina Spellman in Netflix's Chilling Adventures of Sabrina, she went back to her natural hair color, which is (believe it or not) a dark chestnut-brown shade that's similar to the current color of her bold brows. However, in the midst of the audition process, she changed her long, dark brown hair into the short blonde bob we know and love. Keep scrolling to hear what Shipka had to say about her most recent hair transformation. Here is a glimpse of Shipka's natural brown color, which took many, many scrolls through the star's Instagram to find. (It's from way back in 2013!) Even though we firmly believe she was meant to sport blonde hair, we must say, the natural chestnut shade is also extremely flattering on the young actress. "I had long, dark brown hair during my first audition and was really just living my best life," she said. "I've always been blond, so it was like, 'I'm free from the blond hair!' I figured if I got the role, I'd probably have to dye it, which was fine, but after my audition they were like, 'We gotta have you audition again, and we think you need blond hair for it.'" So Shipka returned to her former blonde hair, which was well worth it considering she is now the star of Netflix's take on Sabrina the Teenage Witch. Dyeing her hair wasn't the only change she underwent. She also had to cut it into the short, textured bob that has since become something of a trademark style for her. "This is one of those industries where you never have full control of your hair," she said in the interview. "But the bob is 100 percent my jam. I love it. It's so low-maintenance. It takes two seconds to do my hair." The majority of the Byrdie team has long hair (except for our resident short-haired editor, of course). While we love long, flowing lengths, the lure of something more low-maintenance, especially for fall and winter, has us debating whether or not to take the leap ourselves. After all, some of us take 15 to 20 minutes to style our hair each morning. If we could use that time for something else (namely catching some extra z's or drinking a little coffee), we'd be delighted. So whether or not we ultimately decide to chop our hair into a bob, today we'll be scrolling through the 13 best celebrity bobs for inspiration. If you haven't already, be sure to check out Shipka's exclusive Byrdie interview, in which she talks all things skincare, diet, and more.